Severe thunderstorms can produce destructive hail and damaging winds, even without a tornado. Hail causes nearly $1 billion in damage to property and crops each year, nationwide. Large Hail Safety Tips: “Large Hail” is hail that is larger than 3/4 inch in diameter. Stop driving. If you can see a safe place close-by to drive to (like inside a garage or under a service station awning), do so as soon as you can. Make sure you pull completely off the highway. Do not stop under bridges or overpasses. Stay away from car windows. Cover your eyes with something (like a piece of clothing). If possible, get onto the floor face down, or lay down on the seat with your back to the windows. Put very small children under you, and cover their eyes. Seek shelter immediately in a sturdy building. Stay inside until the hail stops. Stay away from skylights and windows, especially windows that are being struck by hail. Do not go outside for any reason. Large hail can cause serious, or even fatal injuries. If you are caught outdoors, seek shelter immediately. If you can’t find something to protect your entire body, at least find something to protect your head. The Northeast, it seems, is getting more hail – lumps of ice formed in summer months in violent thunderstorms. 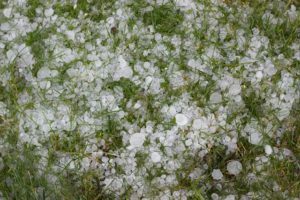 Large hailstones can do significant damage to property, including siding, roofs, windows, and automobiles. *The first step in removing dents and dings from hail stone damage is to park your car outside in the sun. The hot sun helps expand metal, which can cause the dents and dings to pop back out. If the damage occurs during the cooler months, you can also park the vehicle in a heated garage and “turn up the heat”. This is a fast and effective way to repair hail damage without the cost of a body shop. *You can also using a hair dryer to try to repair the dents. This method may work better since you can target the areas directly that you want to pop out. Just be careful not to get your vehicle’s paint too hot, this could cause discoloration.